Jerpoint Abbey, located 12 miles south of Kilkenny, remains one of my favorite monastic ruins in all of Ireland. Built in the late 12th century, it flourished under the Cistercian religious order for centuries, until King Henry VIII ordered all monasteries dissolved in the mid 1500’s What is so unique about this abbey is the number of well-preserved carvings that adorn walls, tombs, and numerous pillars throughout—images from the apostles of Christ, monks and bishops, to knights in armor, damsels in fine attire, and dragon-like creatures. There's even a carving of a man with a stomachache, hands clutching his middle, and maybe more unusual, a man smiling. Visitors can stroll at leisure to enjoy this 800-year-old artistry and to imagine what life was like in a self-sustaining community, where monks tended kitchens, gardens, watermills, a stable, a cemetery, and an infirmary. Another draw to this fortified retreat is what surrounds it. While the abbey sits very close to a highway, the area is remote, peaceful, and home to other fascinating sites. Kell’s Priory, a medieval walled city, is only miles away (see my separate post on this)—and the Church of St. Nicholas, west of the abbey in the town of Newtown Jerpoint, is said to be the final resting place of St. Nicholas, aka Santa Claus. Yes, it’s true that the benevolent St. Nicholas was in fact a Greek, having died in 343 AD, but local folklore and some historians give credence to this odd story. It seems that the ruling Normans of Ireland were serious collectors of religious relics, and when they took part in the Crusades of the holy land, they would have had the opportunity to seize the saint’s bones while passing through his hometown of Myra in modern-day Turkey. Authentic or not, the tomb of St. Nicholas can be found in the form of a large carved slab lying on the ground in the crumbling church cemetery. 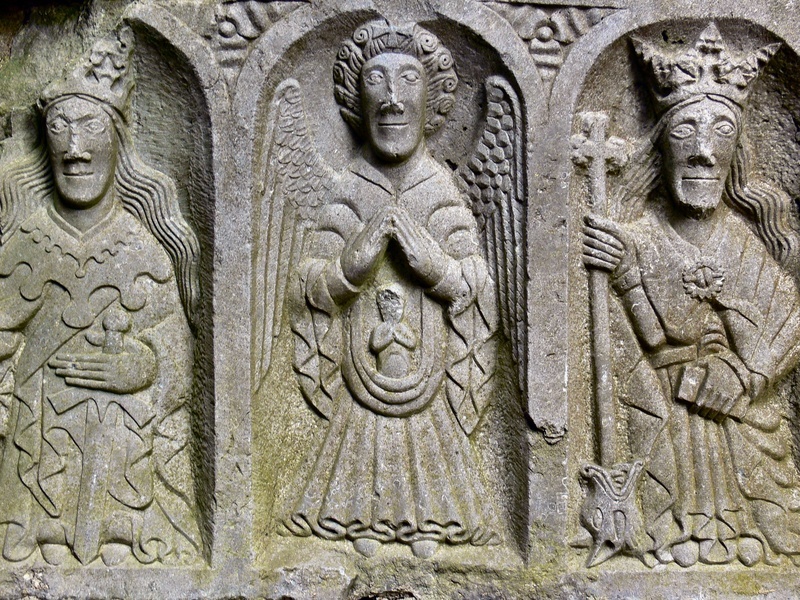 Its simple image depicts the saint with two knights above each shoulder, presumably the knights who brought him to Ireland. As with the carvings of Jerpoint Abbey, it is fun to imagine the inspiration behind the picture—even if the truth, itself, remains long-buried.